Our beta website is up! We’re super excited to let you know that CultureRun is now open! Join our community here. 1. Share A Skill . CultureRun is a community marketplace where anyone — including you — can teach to their peers. Start a learning revolution! Unsure of what and how to teach your skill? Email hello@culturerun.com with the title ‘Pilot’ with a class idea, and our team will help you design a Pilot ShareShop. 2. Host a ShareShop. We’re looking for venues across the city, from bars to boutiques, restaurants to rooftops to join us in creating neighborhood pop-up classrooms where knowledge and creative skills will be shared. Sign up on our website and submit a venue. 3. Suggest an existing class. Have a workshop? A baking workshop in your cooking school or a bookbinding course in your studio? List it as a CultureRun ShareShop and let people know of the awesome services you are offering! 4. Recommend a teacher. There are incredibly knowledgeable people in your own community, do they have crazy awesome skills that people will love to learn? Introduce us to them. Email suzen@cultureyard.com.my with the title ‘Recommendation: <name of person> and their contact and field of expertise. Ways to spread the word? 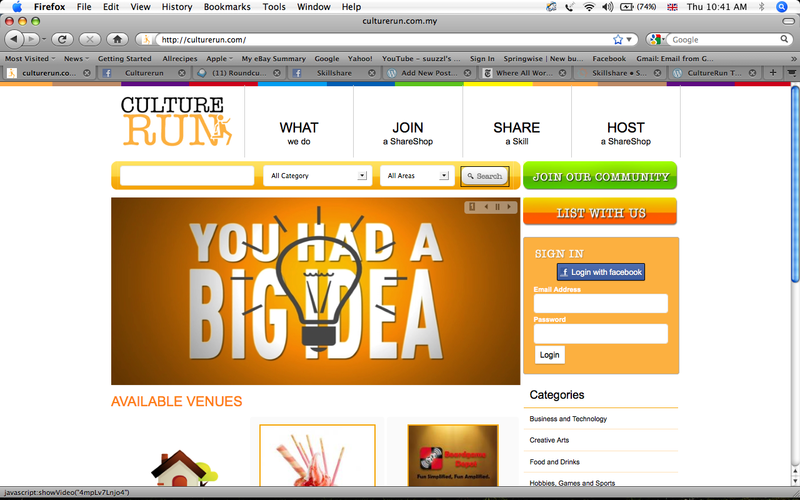 Blog about us, Like us on facebook, twitter your thoughts to @CultureRun and tell your friends and family about us. Thank you again for joining and supporting the spread of knowledge, bringing your community closer and helping us to make learning a lifestyle in your city! Let’s spread the passion together!